There’s something to be said for following a muse, jumping into the deep end of the pool or any other cliché used to describe taking a risk to go after something most wouldn’t or couldn’t do. So as he awaits his co-main event meeting with Sage Northcutt in Boise this Saturday, don’t expect Zak Ottow to be missing Wall Street too much. Leaving the financial world behind was a leap of faith in a lot of ways for the Milwaukee native, but this leap resulted in Ottow not just landing on his feet in the UFC, where he’s won three of five bouts, but in life outside the Octagon, as he’s the co-owner of the Pura Vida BJJ & MMA gym that is starting to earn a lot of buzz for producing Ottow, TUF 28 prospect Leah Letson and Dana White’s Tuesday Night Contender Series participants Montel Jackson and Alton Cunningham. In other words, they’re not the “other” gym in Milwaukee next to the renowned Roufusport gym anymore. 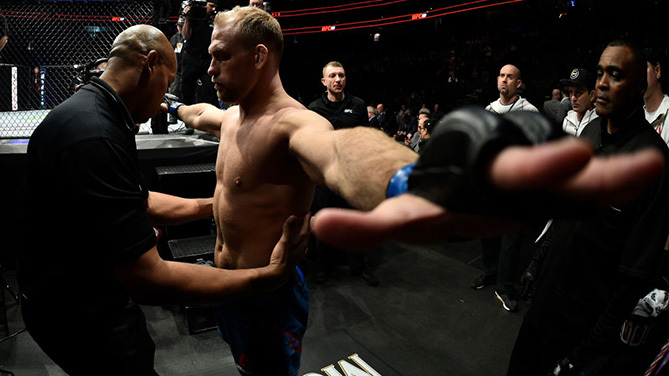 The same goes for the 31-year-old Ottow, who broke past the .500 mark in his UFC career in March with an emphatic first-round knockout of Mike Pyle, who retired after the bout. It’s not something the soft-spoken Ottow goes around bragging about, but in a sport where it’s either you or the other guy, Ottow had to make sure it was him on that night in Las Vegas. “I was a big fan of Mike Pyle before I fought him,” he said. “When I was an amateur just starting out, I’d always tune in when he fought, so it was a really cool opportunity fighting another guy that I looked up to, probably the guy out of all my opponents I was the biggest fan of. Ottow’s first three UFC bouts resulted in three split decisions, with him coming out on top against Josh Burkman and Kiichi Kunimoto while dropping the nod to Sergio Moraes. In fight four, he was stopped by Li Jingliang, but the Pyle fight put him back on the positive side of the ledger, and now he wants to keep that winning and finishing momentum going against Northcutt, who is returning to the welterweight division after two consecutive wins at 155 pounds. And though you might think it’s a similar situation to the Pyle fight, going from fighting someone he was a fan of to fighting the nicest young man in the world, it’s not quite that way for Ottow. If he is, Ottow has the style to find out, as he will be in Northcutt’s face from start to finish, making it clear that while “Super Sage” has received the lion’s share of the attention leading up to the bout, “The Barbarian” is not about to give up any ground on fight night.